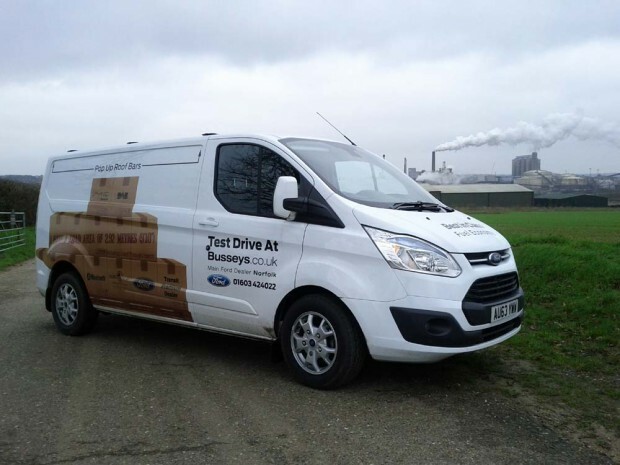 Home» Road Tests » Ford Transit Custom Contract Hire & Leasing Review. The new Ford Transit Custom is a stylish, practical, and economical one-tonne panel van offering a great drive and a thoughtfully trimmed interior. It is certainly the best ever Transit; and with class-leading features in all the right departments – running costs, performance, load capacity, safety, and equipment – the Ford Transit Custom is arguably the best one-tonne van on the market today. It’s no surprise that this new Ford Transit Custom was International Van of the Year 2013. 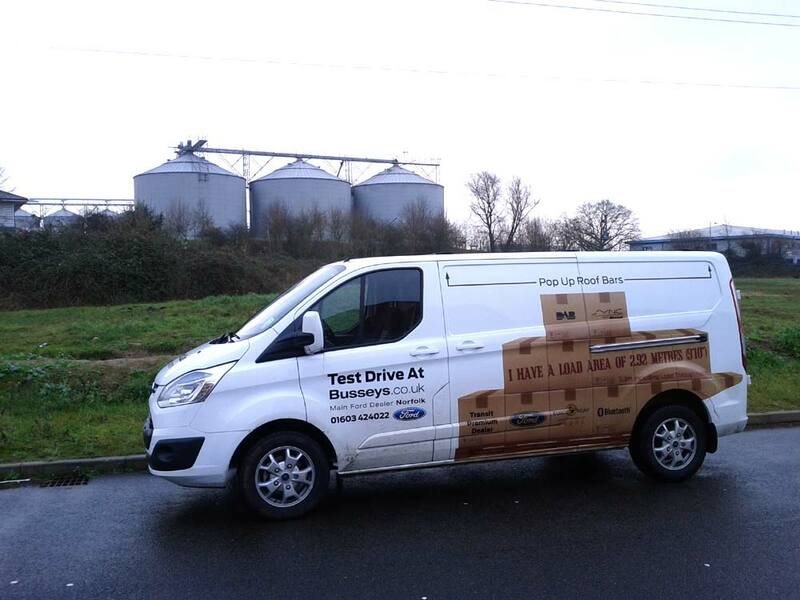 Our test vehicle was the Ford Transit Custom 155PS Limited, kindly provided by Busseys, Main Ford dealership for Norfolk. 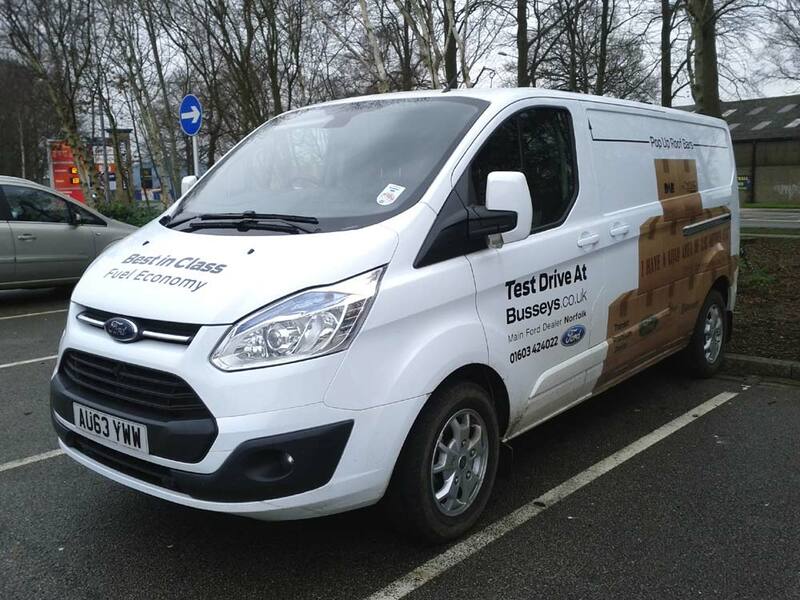 The full Ford Transit Custom range is available on contract hire here at Bussey Vehicle Leasing. Starting and finishing in Norwich our run out in the Transit Custom transported the two of us, and an ever increasing cargo, on a 125 mile plus meander through the south Norfolk and north Suffolk countryside. 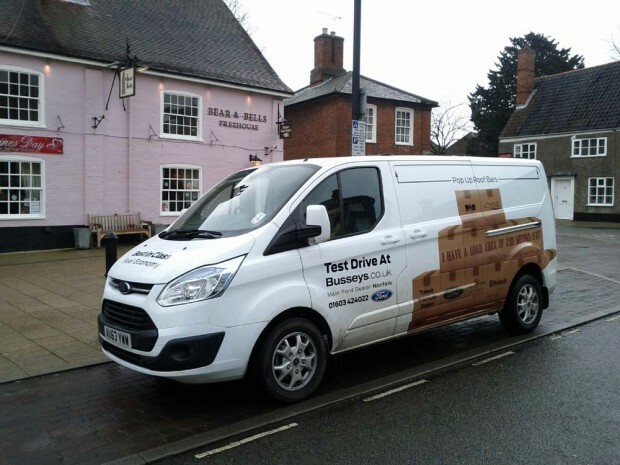 We had pick-ups in Thetford, Bury St Edmunds, Stowmarket, Halesworth, Diss, Bungay, and Beccles on-route. The weather was miserable with intermittent rain throughout the day, but that wasn’t going to bother us in the Transit Custom during our test. The interior features so many comforts and toys this new Transit is a real pleasure to travel in whatever the road conditions. The seats are comfortable and supportive and long distances (or long queues) should never be a problem for occupants. For the driver there are plenty of seat and steering rack adjustments to get just the right driving position. In fact, the interior feels more like a Mondeo than a van, while the ride and handling is surprisingly car-like, more akin to driving a modern MPV. Entertainment in the Ford Transit Custom is provided by an excellent voice activated DAB radio with USB and Bluetooth connectivity, while the trip computer allows you to keep an eye on economy, and range. Ford claims class leading fuel economy for the Transit Custom and to help you achieve this there is a handy indicator suggesting when to drop or change up a gear. Elsewhere there are plenty of clever drinks holders and storage compartments including a space in front of the wheel containing the USB port and one of two 12v sockets in the van. With a pop-up lid it’s a handy space to stash your phone or music player. Trim levels are good throughout the range with Base, Trend and Limited variants. Our Transit Custom Limited was also fitted with parking sensors, air conditioning and a tow bar (enabling the van to tow a braked trailer up to 2000kg). The Transit’s six speed manual transmission is slick and precise while performance from the 155ps 2.2 Duratorq TDCi engine is energetic with plenty of torque, even when fully loaded. On the quickest part of our route, the A11 between Norwich and Thetford road holding felt assured while the cabin was quiet with wind noise minimal. At 70mph you’re still under 2,000 rpm in top gear. The Transit Custom feels so safe it was comforting to find our Limited variant fitted with cruise control so a steady speed could be maintained. It’s another feature that will appeal to van drivers that cover long-distances encompassing endless restricted zones and monitored road maintenance projects. After the first pick-up near Thetford in Norfolk we found the A134 and continued in the Transit to Bury St Edmunds in Suffolk. Inevitably we encountered some large and slower vehicles but this enabled us to see if the Transit Custom has enough mid-range power for safe overtaking. The answer, at least for the Ford Transit Custom 155ps, is a definite ‘yes’. Dropping the gears provides smooth and progressive power without ever over-revving so you can ease past slow traffic unflustered. After another cruise, this time along the A14, we navigated our Transit Custom to a pick-up at Stowmarket in Suffolk and then back on single carriageways of the A140 to Diss in Norfolk. The Ford Transit Custom also scores well on the twisty roads with sure-footed corning and minimal body roll, while your passengers will stay in their own seats. Your cargo should also stay in place in the back. The next part of our journey in the Ford Transit Custom sent us along the excellent A143 through the Norfolk towns of Harleston, Bungay and on to Beccles in Suffolk. The final leg was the A146 back to Norwich. The purpose of our trip was to collect a number of small and medium sized furniture, plus a large heavy piece, and some timber. We had already calculated that the Transit Custom’s load space would be sufficient with around 3m length and a total 6 cubic meters in our short wheel base model (the LWB offers 6.8 cubic meters). What mattered for us was access to a 75% packed van in a tight spot at Beccles and a surprisingly muddy driveway near Bury St Edmunds. But the Transit Custom was a pleasure to work in, with the wide side opening door providing adequate entry for the largest item and the load floor liner easy to sweep clean of the worst mud and debris. A number of LED lights ensured the load area is well lit throughout. The Transit Custom also features a floor level hatch for longer items and pop-up roof rails for additional loads. There are three variants of the 2.2 TDCi engines on the Transit Custom with 100PS, 125PS and 155PS options offering fuel economy potential from 40.9 to 42.2 mpg (combined). Our demo vehicle, the Ford Transit Custom 155ps, showed less than 2,000 miles on the clock so optimum fuel efficiency will come when the engine is run in, but our short drive through the countryside and local towns is enough to be confident that real world fuel efficiency won’t be too far away from Ford’s class leading claims. Service intervals are well spaced at 30,000 miles or two years (1 year/15,000 miles for the interim check) and there is a 12 year anti-perforation warranty. CO2 emissions readings are 178 g/km to 183 g/km and road tax is currently £215. The 5-star NCAP awarded Transit Custom boasts many safety features including Driver Alert, Emergency Assistance, Lane Keeping Alert, an advance braking alert and a hill start control system. Other features include Roll-over Mitigation (ROM), Emergency Brake Assist (EBA), Electronic Stability Programme (ESP), Load Adaptive Control (LAC), Trailer Sway Assist (TSA), Traction Control System (TCS) and ABS with brake-force distribution (EBD). Security in the Ford Transit Custom is aided by high level alarm options, advanced central locking and remote control, anti-tamper locks, and a full steel bulkhead. The new Ford Transit Custom range is sure to attract existing Transit contract hire customers while the van’s widening appeal and consistently enthusiastic reviews will persuade a whole new group of fans to switch from other manufacturers’ one-tonne panel vans. 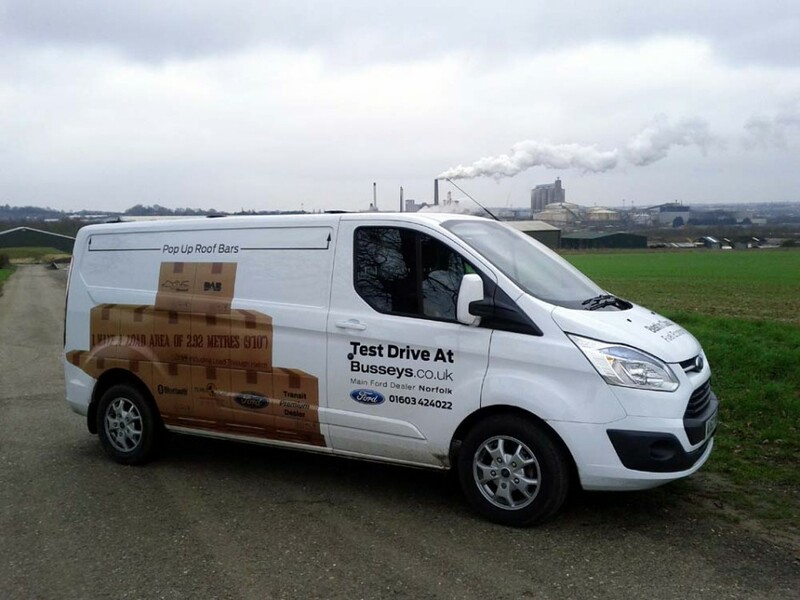 Call us on 01603 253121 to discuss your next Ford Transit Custom lease hire package. Or search the Ford Transit Custom range and request a contract leasing quote online.